Julie McCarthy Julie McCarthy has traveled the world as a international correspondent for NPR. Julie McCarthy has traveled the world as an international correspondent for NPR, heading NPR's Tokyo bureau, reporting from Europe, Africa and the Middle East, and covering the news and issues of South America. McCarthy is currently NPR's South East Asia correspondent. Previously she served as NPR's international correspondent based in New Delhi, India. In April 2009, McCarthy moved to Islamabad to open NPR's first permanent bureau in Pakistan. Before moving to Islamabad, McCarthy was NPR's South America correspondent based in Rio de Janeiro, Brazil. McCarthy covered the Middle East for NPR from 2002 to 2005, when she was dispatched to report on the Israeli incursion into the West Bank. Previously, McCarthy was the London Bureau Chief for NPR, a position that frequently took her far from her post to cover stories that span the globe. She spent five weeks in Iran during the war in Afghanistan, covered the re-election of Robert Mugabe in Zimbabwe, and traveled to the Indian island nation of Madagascar to report on the political and ecological developments there. Following the terror attacks on the United States, McCarthy was the lead reporter assigned to investigate al Qaeda in Europe. In 1994, McCarthy became the first staff correspondent to head NPR's Tokyo bureau. She covered a range of stories in Japan with distinction, including the Kobe earthquake of 1995, the 50th anniversary of the atomic bombing of Hiroshima, and the turmoil over U.S. troops on Okinawa. Her coverage of Japan won the East-West Center's Mary Morgan Hewett Award for the Advancement of Journalism. McCarthy has also traveled extensively throughout Asia. Her coverage of the Asian economic crisis earned her the 1998 Overseas Press Club of America Award. She arrived in Indonesia weeks before the fall of Asia's longest-running ruler and chronicled a nation in chaos as President Suharto stepped from power. Prior to her assignment in Asia, McCarthy was the foreign editor for Europe and Africa. She served as the Senior Washington Editor during the Persian Gulf War; NPR was honored with a Silver Baton in the Alfred I. duPont-Columbia University Awards for its coverage of that conflict. McCarthy was awarded a Peabody, two additional Overseas Press Club Awards and the Ohio State Award in her capacity as European and African Editor. McCarthy was selected to spend the 2002-2003 academic year at Stanford University, winning a place in the Knight Journalism Fellowship Program. In 1994, she was a Jefferson Fellow at the East-West Center in Hawaii. March 8, 2019  The Philippines president insists on disclosing names of candidates allegedly linked to illegal drugs. Critics says it is a violation of the constitutional presumption of innocence. February 15, 2019  Journalist Maria Ressa has been released on bail after she was arrested on Wednesday on charges of "cyber libel." Her arrest came amid fears of a broader crackdown on the press in the Philippines. December 24, 2018  Sleigh bells, snowy skies and a glowing fire evoke an idyllic Christmas. But the tropics can be just as festive. 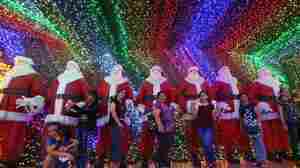 The Philippines boasts the longest yuletide season in the world. 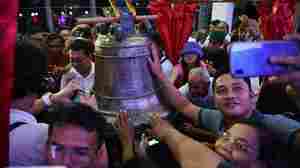 December 15, 2018  The bells return to Balangiga after 117 years in U.S. custody. December 11, 2018  During the Philippine-American War, U.S. troops seized three bells as war trophies. Now the U.S. has flown them back. December 10, 2018  This week the United States and the Philippines end a 117-year-old feud. 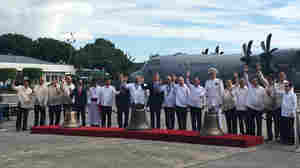 Church bells carted off by American soldiers during the U.S.-Philippines War will be formally handed in at a Manila air base. November 22, 2018  China's leader seeks to bring an old U.S. ally into his sphere. 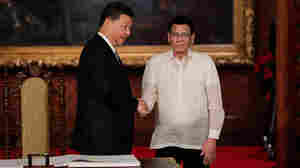 But the Philipine people are sceptical that China will deliver on its promise of billions of dollars in aid. November 19, 2018  Xi Jinping leaves Tuesday for a week-long visit to the Philippines. Ties between the two countries have grown closer in recent years — as both have faced challenges in relations with the U.S.
October 29, 2018  An Indonesian airliner crashed into the sea shortly after takeoff from Jakarta. According to local reports, it suddenly lost altitude and disappeared from radar. October 25, 2018  Super Typhoon Yutu came ashore in the Northern Mariana Islands last night, bringing category 5 hurricane force, with sustained winds of 174 miles per hour.